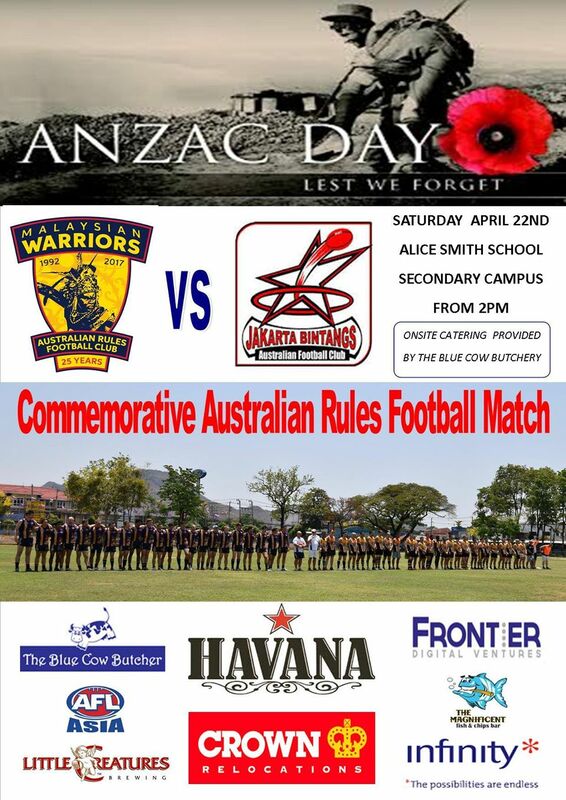 There is no doubt Anzac commemorative games are now a massive part of the Aussie rules footy landscape, but no more so than in Asia where the connection to the people and places effected by the wars of the past are so strong. This weekend once again will see a number of AFL Asia’s Clubs host commemorative matches right across the Asian region, with the AFL Asia Anzac Round of matches getting bigger and better every year. In this year’s game of the round, the 1-0 Malaysian Warriors will host their first home game for 2017 against the Jakarta Bintangs. The Bintangs have a great record in Anzac Matches defeating the Vietnam Swans in Vung Tau last year and always put forward a solid squad of expats and their ever-improving Garudas locals for the occasion. However, the Warriors rarely lose at home and will be keen to continue their good start to 2017 in this their 25th anniversary year. Having recently surpassed the 100 members milestone, the Warriors are well backed and should provide the biggest test yet for the Bintangs, who go into the game unbeaten sitting pretty on top of the AFL Asia ladder with a 3-0 record. 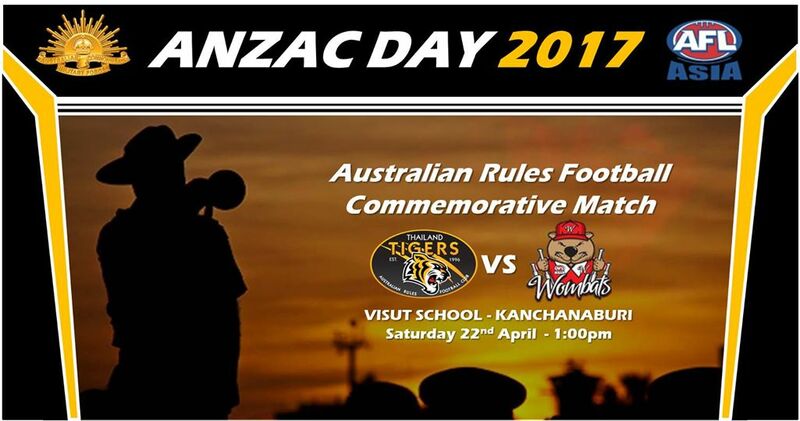 The Thailand Tigers’ long-running Anzac Day Match at Kanchanaburi is always a big fixture for clubs around Asia, with the Singapore Wombats this year making the trip north of Bangkok to the bridge over the river Kwai. The “Thaigers” are rebuilding after a big exodus of players last year and should have a few new faces against a formidable Wombats team, who will play their first game since their Asian Champs Grand Final loss in Saigon last October. 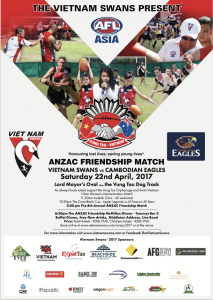 Pride will be on the line for the Vietnam Swans at their spiritual home the Lord Mayor’s Oval in the southern Vietnamese town of Vung Tau this weekend. 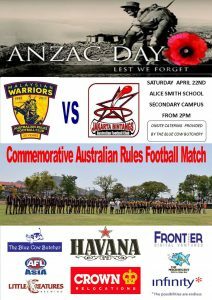 Since winning the 2015 Manila Cup, the Swannies have been disappointing on the field, no more so than last year’s Anzac loss to Jakarta, only the second time visiting opposition has won in the history of their prestigious Anzac Friendship Match. Further disappointments at successive Asian Champs and IndoChina Cups will have new Coach Al Shiells looking to this weekend’s massive game against old rivals the Cambodian Eagles as an opportunity to get their season back on track, after a slow 0-2 start to the 2017 AFL Asia season. A rapidly maturing Cambodian Eagles side packed with exciting young Khmer talent have an excellent recent record against the Swans and will go into the game with plenty of confidence. Just three weeks ago the Eagles were very impressive in their 87-27 touch up of the Swans in Phnom Penh, backing up their solid defeat of the Swans and first ever tournament victory in Myanmar in November at the Indo-China Cup. 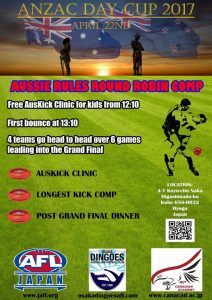 Round 4 of the South China AFL will be played this weeknd in the middle of HK’s famous Happy Valley Racecourse. The mostly-local Guangzhou Scorpions have made a great start to a massive year for their program, currently sitting on top of the SCAFL ladder after three rounds with a 6-1 record and will be looking to improve on that against the other HK mostly-expat clubs. 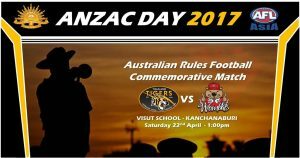 The Osaka Dingoes will play host of the Japanese 2017 Anzac Day Cup, to be held on Saturday April 22nd and will be played at the Canadian Academy on Rokko Island. 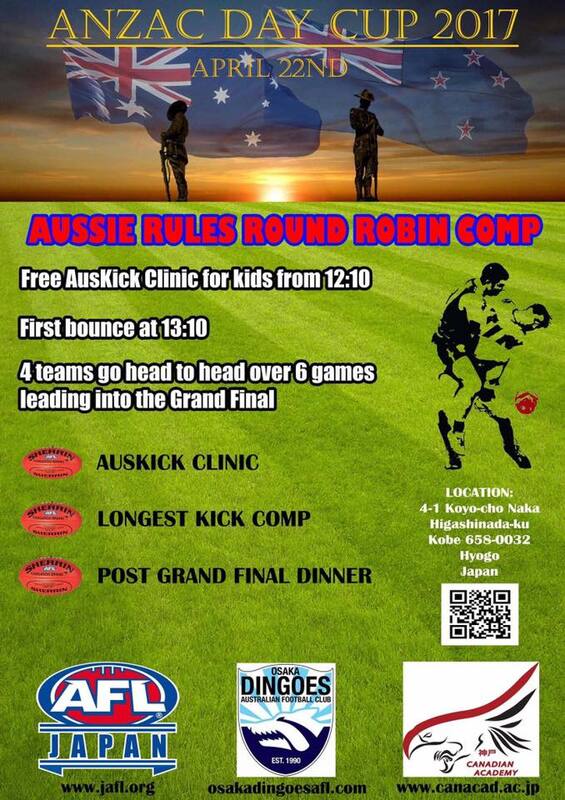 The Anzac Day Cup will see 4 sides play each other in a round-robin series, including the National Side competing at this year’s AFL International Cup – The Japan Samurais, the Tokyo Goannas (AFL Japan Top League Back-to-Back Premiers 2015-16), as well as a merged side consisting of players from Sendai Port, Hiroshima Cranes and the Nagoya Redbacks. The host team, the Osaka Dingoes round out the 4 teams and will be playing their 1st game as a Club since 2015 and are hopefully on a pathway which will see them reinstated back in the AFL Japan Top League in 2018. The Osaka Dingoes haven’t played in the AFL Japan Top League since their Grand Final loss in 2013.